I wonder if anyone here can help me with a Sega System 1 conversion board? It's a Pitfall II, and I'm trying to convert it to a Wonderboy without altering the original board. (I'm keeping the original Pitfall II roms so it can be reverted back if needed - even though some have rubbish labels currently). doing a direct copy of the ROMs on that, for the new ROMs on this board. However, I've hit a snag. The CPU Rom data on that board doesn't run on this one. So I ran RomIdent.. and it coudn't identify the first 2 CPU rom images. Only the third! (All the graphics and audio ones were fine too). So am I hitting encrypted code here? The Pitfall II I'm running here (and trying to convert) has the label 834-5627-10. It also has a main CPU daughterboard, which underneath has a PAL. Looking further into the Pitfall2 CPU ROMs (6456A / 6457A / 6458A) they are indeed the encrypted romset in mame. z80 in the main CPU socket (Well an NEC D780C) - and the Pitfall2 CPU roms appear to be unencrypted (6623 / 6624 / 6625). Most recently, CnP supplied me with a photo of his conversion PCB, which is also an 834-5627-10 labelled Pitfall2 like mine, running Wonderboy. 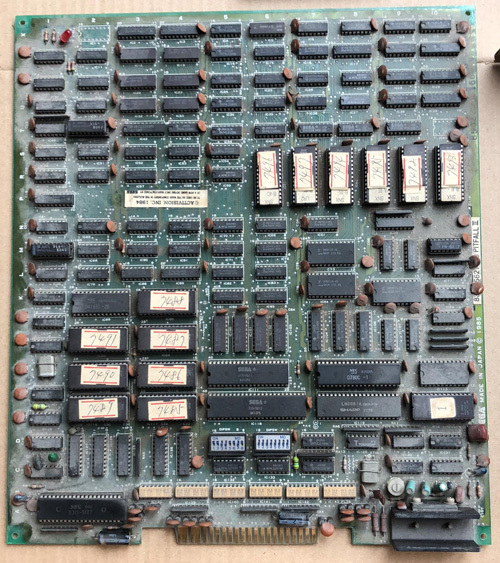 Like the other conversion PCB I've seen, he doesn't have the daughterboard, so I suspect that's been removed and swapped with a standard z80a. Although his chip appears to be labelled D315-5177 - which gives me a hint as to which romset will be on his first two CPU roms. I guess it's not possible to get NEC D315-5177 chips. Or 315-5135, 315-5178 to match the other Rom sets that are in mame? and then just run standard Wonderboy 315-5177 CPU roms? Or even better, is there a version of the Wonderboy romset that runs on the Pal protected stock pitfall 2 z80 daughterboard? (I doubt that, but you never know!). This sounds like an undumped revision not currently in Mame. 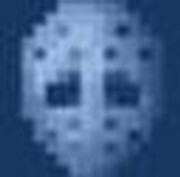 If possible, could you send me a copy of the roms by pm, so we can possibly add it one day? What were the rom labels/names on this copy you could not match up in romident? I would not play around with an original Pitfall 2 board, it's expensive these days. Sounds like you need to remove the daughter pcb and put in a standard z80 or use encrypted roms. The 'undumped' roms aren't in mame as they're recent(ish) decrypted / hacked roms made to run on Pitfall II pcbs. Your Pitfall II runs encrypted code, the small daughterboard is a replacement of the custom CPU originally marked '315-5093'. So all you need is to use a regular Z80 and an unencrypted ROM set but I warn you that all the unencrypted Wonder Boy ROM set in MAME are not good for your conversion.I know someone has prepared proper code but it seems it's not of public domain. I did a full decryption of the 315-5177 Wonderboy as I kept seeing complaints about the unencrypted prototype version. I also did the System 2 315-5177 as this is the one I needed to convert my Choplifter pcb. They are in my patcher already but I haven't finished up the docs yet as have been too busy with other stuff. Drop me a PM and I can probably sort you out. Hey, I just want to say a huge thanks to everyone who helped me with this conversion PCB. Hence why it's not in MAME as a separate romset. Pretty soon I had the patched roms running in MAME, and even corrected the attract sequence 'LISENCED BY' spelling mistake that always bugged me. Today a new NEC D780C CPU arrived (it's a 2.5mhz Z80) so I was able to finally put this to the test and happily it's running the game just fine. I was worried I'd need a 4mhz z80, which would be a D780C-1, but no it seems just fine. I'm sending the daughterboard to Porchy for now to see if he has any joy working out what the PAL is doing along with the PROM and z80. But I'll retain this and the original Pitfall II encrypted roms together so this PCB can always be reverted if needed. So I'm finally able to play one of my very fave games without the graphics flickers that affect the bootleg scrolling tiles - over the moon about that! I've noticed some chips on the pcb getting reasonably toasty hot while this is running. Notably Fush*tsu MBM2148L's, but also some small socketed 18DIP IC's near the tile eproms silkscreened 'Sega 315-5025' (IC46, IC47, IC48). Voltage is under 5v on these. Should I be worried? 2148s are RAMs which will always run hotter than other ICs. Nice job there Finnster ! I am still looking for an original or converted PCB at the right money. Preferably not working so its cheep. This pens another door for me. Cheers for the info Eq! Fingers crossed then. And yes, my search has been ongoing since I first joined arcading forums! I'll still leave the request out there to find a genuine original WonderBoy for my dedicated cab, but it's been a very long time searching trying to find one that's not rediculous money. This is as close as I get for now! Would I convert it back for a profitable sale? No. I buy to play the games I love. Fact is I'm not particularly fond of Pitfall II, but I respect this is an original board, so I won't wreck it. I am the same mate i buy to repair and keep. As i tend to buy in bulk there are ones i am not interested in so i trade or sell them along with any duplicates. I dont have much space at the minute so dont play them as much as i would like. Hopefully in the future though as i have got a shed load of boards now !! Ebay idiots push the price of boards up way out of the reach of many. Wants banning !